Iran’s Guardian Council nixes both former president Hashemi Rafsanjani and Rahim Meshai, President Mahmoud Ahmadinejad's acolyte and adviser. Iran's chief nuclear talks negotiator Saeed Jalili attends a news conference at the Iranian Consulate in Istanbul, May 16, 2013. Jalili has emerged as a front-runner in Iran's presidential race. After a day of rumors and counter-rumors, it’s official: President Mahmoud Ahmadinejad ally Esfandiar Rahim Meshai and former President Hashemi Rafsanjani have been disqualified by the Guardian Council as candidates for the June 14 Iranian elections.The question some will be asking is: Why? After all, allowing Meshai and Rafsanjani to run would have added more legitimacy to the elections and more people would have turned out to vote. This would have given the Islamic Republic a much-needed boost to its foundering legitimacy. While legitimacy is important to Iran's powers that be, what's more important is stability, especially at a time when the regime is facing increasing divisions as well as economic challenges. The rewards of allowing Meshai and Rafsanjani to run simply do not seem to have justified the high cost, as both would most likely have publicly questioned policies directly involving the domain of the supreme leader. Take Rafsanjani, for example: He's the most senior person in Iran to have stated publicly that the chances of Syrian President Bashar al-Assad's survival are small. Some conservatives inside the regime saw this as a gift to Iran's enemies, while others could have interpreted this as his criticism of the supreme leader and the Islamic Revolutionary Guards Corps’ (IRGC) continued support for Assad. Had Rafsanjani been allowed to run, he could have brought this and the current nuclear policy up as election issues. This would have exposed such policies to public scrutiny, and criticism, none of which the supreme leader and the IRGC want in the public domain. The same goes for Meshai. His participation would have created more divisions within the regime. Much like Rafsanjani, his participation would have united the often disunited conservatives; nevertheless, in the eyes of Iran's leadership, he seems to be too much of a divisive figure. And in all likelihood he, too, would have brought up what many in the regime consider to be taboos as election topics, such as discussion of “Iranian Islam.” This is a thorny issue which raised the ire of the IRGC and the clerics before and could do so again as nationalism is a popular subject among many Iranians. The fact that he recently threatened to reveal “behind the scenes information” is likely to have damaged his chances of having his candidacy approved even more. The disqualification of Meshai means the end of his and Ahmadinejad's political careers. It also ends any ambitions Rafsanjani had to return to Iranian politics as a senior official. However, things could get worse if Rafsanjani and Ahmadinejad decide to foment instability because of the Guardian Council’s ruling. Should the supreme leader see them as a challenge to stability, the possibility of their being placed under house arrest should not be dismissed. Rafsanjani and Meshai were not alone in being disqualified. Other known figures were also disallowed by the Guardian Council. These include former Intelligence Minister Ali Falahian, Ahmadinejad's former Foreign Minister Manuchehr Mottaki as well as Mostafa Kavakoobian, who's a moderate MP. Out of the eight who were qualified, it seems that three have the best chance of winning — nuclear negotiator Saeed Jalili, Tehran Mayor Mohammad Bagher Qalibaf and former Speaker of the Majles Gholam Ali Hadad Adel. Other conservatives who were qualified but for now are believed to have a lesser chance are former Foreign Minister Ali Akbar Velayati and former IRGC commander Mohsen Rezai. Meanwhile, other more reformist and centrist candidates include former nuclear negotiator Hassan Rouhani, Khatami's deputy Mohammad Reza Aref and the lesser-known Mohamad Gharzi, who served under Mir Hossein Mousavi and Rafsanjani as minister for oil and post and telegraph. The reason why they were allowed to run and Meshai and Rafsanjani were not is most probably related to the fact that they are not as outspoken and divisive figures. From now until Election Day, the supreme leader could best be described as the head of a panel of the talent show. With Ayatollah Ali Khamenei as ultimate arbiter holding the only veto, the rest of the panel is likely to include the IRGC, senior members of the Guardian Council and the office of the supreme leader. They will decide which person to pick to act as the president of the Islamic Republic of Iran for the next four years, based on the supreme leader's criteria. Acting skills, especially especially sticking to the script, will be highly sought after as the last winner, Ahmadinejad, decided to improvise on a number of occasions — something which the supreme leader won’t want repeated again. Auditions and curricula vitae will not be the only things that count. Lobbying power will also be important. The candidate who can have the most powerful centers of power inside the regime lobbying for him with the supreme leader is likely to significantly improve his chances. For now it seems that in the lobbying race, Jalili's KIA Pride is beating other contestants, especially Mayor Qalibaf. Recently, Ayatollah Mesbah Yazdi's previously endorsed candidate, Kamran Bagheri Lankarani, decided to drop out of the race to give his spot to Jalili. This means that Jalili will now be fully supported by the conservative Paydari (steadfastness) coalition. The same goes for Ahmadinejad's brother Davood, who has fallen out with his brother over Meshai. Hadad Adel even stated recently that the members of his 2+1 coalition (Velayati, Qalibaf and himself) may also drop out to support Jalili. Twenty-four days is a long time in Iran's action-packed politics. A lot can happen. But for now, Iranian politics is the only racing course in which Jalili's slower KIA Pride has already beaten Rafsanjani's Mercedes-Benz. 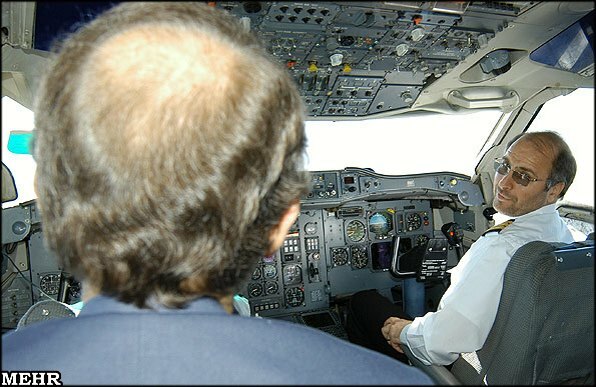 Qalibaf's Airbus, which the Tehran mayor has been flying for numerous years, should watch out.